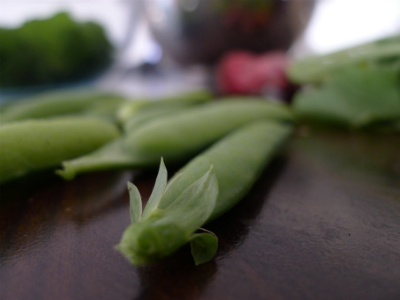 There’s been peas, broad beans, radishes and so much salad, I haven’t managed to pick it all before some of it bolted (that’s when it flowers or ‘goes to seed’, which usually means the leaves go too bitter to eat). 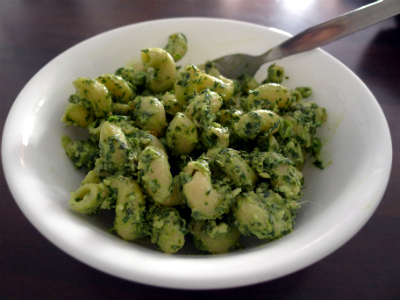 But I can’t bear to throw anything out so I managed to salvage the leaves by using this handy radish leaf pesto recipe from Chocolate and Zucchini. The key is to blanch the radish leaves or any other bitter greens with a quick splash of boiling water to remove the worst of the bitterness. Then when blitzed with some cheese, nuts, garlic and olive oil they make an awesome, tangy lil sauce for pasta. Crush the capers and garlic together in a mortar and pestle if you have one. If not a food processor works fine too. Add the vinegar and olive oil, mix well and season to taste. Ideally, the dressing should be left to sit for 5-10 minutes to let the flavours blend together. about 1.5 cups of grains: I use about even parts brown rice, wild rice, quinoa, bulghur wheat and sometimes some couscous too (or even the large, Israeli couscous grains if I can find them). 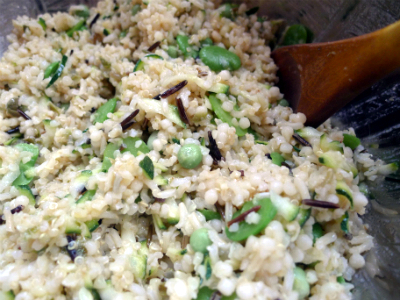 Of course you can use whatever you have on hand or even just one grain like couscous. But do check out this list of wholegrains for more inspiration and some information on the health benefits. Basically most white flours and grains have had some of their nutritious parts removed, while wholegrains have literally been left whole so you get all the goodness. about 2 cups of vegetables: I’ve been using blanched broad beans and peas plus some grated courgette and carrot but you can get as creative as you like here – using spring onions, peppers, asparagus, roasted cauliflower, broccoli, or spinach for example. Put a large pot of water on to boil. Meanwhile, check the cooking times for your grains. Add to the pot whatever grains take longest to cook – usually barley or rice – and set your timer. Check the cooking times for the rest of your grains. Many of the others take about 15 minutes to cook, so when there’s 15 minutes left on your timer, add them in. Prep or cook the vegetables as necessary while the grains are cooking. 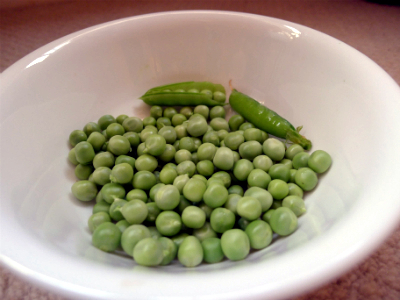 If possible add them to the same pot to cook and save on washing up – ie add your peas for the last two minutes of cooking. Couscous usually doesn’t need boiling, you just add it at the end of cooking, cover and let sit, off the heat for a few minutes. You might need to pour off some of the water so it’s just covering the couscous. When everything’s cooked, drain if needed and combine all ingredients in a large bowl, including the dressing. I like to add the dressing while it’s still warm as I find the flavours are absorbed better this way.